The annual growth rate of total credit to euro area residents stood at 3.7% in January 2018, compared with 3.8% in the previous month. The annual growth rate of credit to the private sector increased to 3.1% in January 2018, from 2.9% in December 2017. The annual growth rate of adjusted loans to the private sector (i.e. 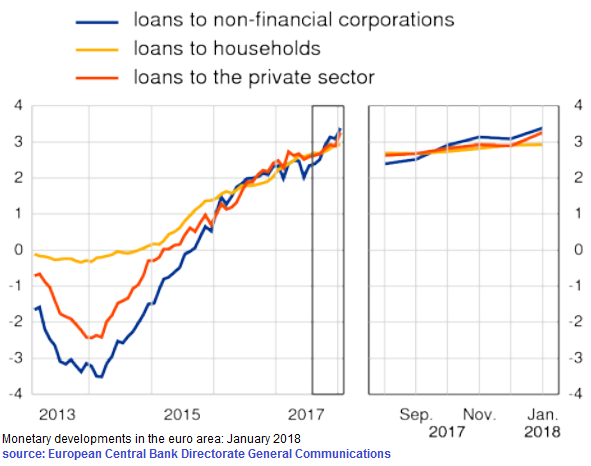 adjusted for loan sales, securitisation and notional cash pooling) increased to 3.3% in January 2018, from 2.9% in December 2017. 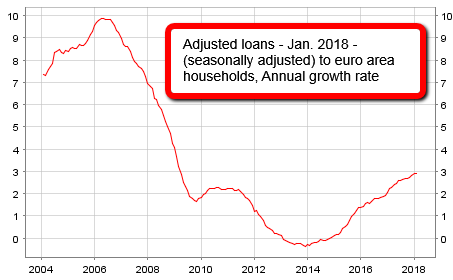 In particular, the annual growth rate of adjusted loans to households stood at 2.9% in January 2018, unchanged from the previous month, and the annual growth rate of adjusted loans to non-financial corporations increased to 3.4% in January 2018, from 3.1% in December 2017.